Poland's third largest city has managed to curate an amazing collection of large-scale murals by some of the best urban artists in the world. Here are some photos and all the details about the best street art in Lodz. Last fall, I found myself looking at different alternatives for an urban solo weekend getaway. I wanted to travel somewhere new, ideally a budget-friendly destination with great street art. Some of the best flight deals I found were to Warsaw. And when I started looking for information about street art in Poland, images of some of the most iconic murals in Lodz kept popping out. As it turns out, with the creation of its Urban Forms Gallery project in 2009, the city of Lodz has managed to grow an impressive collection of large-scale murals by some of the most recognized international street artists. In fact, if you are into street art, you’ve probably seen photos of some of the murals featured in this post at some point. So, after carefully pondering the pros and cons, I finally decided to book a flight to Warsaw with the intention of adding an extra couple of hours by bus to my journey and spend my weekend in Lodz, instead of the Polish capital. During my time in Lodz, I came across several more works from the guys behind the Etam Cru duo. The old lady holding the chicken was definitely one of my overall favorite pieces. Then there was this huge mural below, in the Off Piotrkowska complex, which is a collaboration with another emerging Polish artist Robert Proch (a.k.a. Tone). Plus, I was really stoked to see the one further down, titled Primavera by Sainer, one of the members of Etam Cru. That one is probably one of the most iconic murals in Lodz. Looking for street art around Lodz gave me the opportunity to see for the first time works by some of Poland’s most renowned street artists, such as M-City — a graphic designer based in Gdańsk who usually features industrial and urban elements in his murals, Pener — an artist who creates interesting compositions with geometric shapes and angular forms, and Cekas — the artist behind this interesting piece below titled Cisza / Silence, which was made using 1300 metal bars sticking out of a wall. The impressive mural collection in the city of Lodz doesn’t only cover some of the most well-known local Polish artists. There are also plenty of works by some very famous international urban artists. For example, I was ecstatic when I saw this massive bird by Portuguese artist Bordalo II, who builds big animal forms using waste materials. Ever since I first saw some photos of his works, I’ve wanted to see one in person. So I was really stoked to find this one in Lodz. I actually stayed about 15 minutes in front of it, trying to figure out what it’s made of. Another big first for me was seeing this mural above by Eduardo Kobra — one of the most well-known street artists from Brazil. It is a fun and colourful portrait of Arthur Rubinstein, a classical pianist who was born in Lodz and is considered one of the greatest in the 20th century. I was also happy to see several works by some old-time favorite street artists. For example, I really liked the collaboration between Brazilian duo Os Gemeos and Spanish artist Aryz, whose work I had already seen in Hasselt, Belgium. Actually, there were a few murals by Aryz. My favorite is the one titled Love Letter, which you can see further down. Another pleasant surprise was finding works by ROA and Vhils. The first is an artist from Belgium who mostly paints monochromatic murals of animals. I’ve been lucky to see some of his works in Belgium, London, and Chile. And the second is a Portuguese artist who is well-known for his particular technique of doing portraits by drilling on the walls rather than painting. His art pieces are often mesmerizing. I first saw his works during one of my trips to Berlin. One thing that I was not expecting is how big Lodz actually is. I thought it was much smaller and that going around searching for street art would be less tiring. But during those two days, I walked a lot and I still didn’t manage to see everything. And the fact that the days were shorter didn’t help, by 4 pm there wasn’t enough light to take good photos. When I realized I was not going to be able to see everything, I decided to cut some corners, so to speak, and concentrate in the areas with the most murals. So I decided not to see those that were located further from the city center. It was a tough choice, because there was one mural in particular that I really wanted to see. It’s a huge artwork by Chilean artist INTI, whose work I first saw in his native Valparaiso. I was really bummed about that. Luckily, there was another mural by INTI in Lodz (below, left) and that was enough consolation for me. Besides that, I was happy to see works by a couple more artists I recognized. There was an interesting mural by Brazilian artist Nunca, whose work I’d only seen once in Modena, Italy. And, another one of my favorite murals, was this massive deer by Chinese artist DALeast. Since I first saw one of his works in Heerlen in the Netherlands, I became a fan of his animal paintings. Finally, another place I enjoyed visiting was the Pasaż Róży, a spectacular installation by Polish artist Joanna Rajkowska. For this project, she covered in mirror shards the entire façade of the buildings in this courtyard creating a mesmerizing visual effect. If you go to Lodz, you really should pass by. It’s a very unique place and photos don’t make it justice. Also, further in, on that same courtyard, there is a piece of lace art by Polish artist NeSpoon. I’d only seen photos of her works online, so I was really happy to bump into this by chance. In the end, I can say that I am impressed by the quality of the street art in Lodz. So far, they have managed to curate a splendid collection featuring some really amazing artists. So I think it’s exciting to see how it keeps evolving. In fact, I’d love to visit again, perhaps in summer or fall when the weather is nicer, and see those murals I didn’t have time to check out and those that have been created since then. Here is a map pinpointing most of the street art I saw in Lodz. Also, I used this map from Street Art Cities as a guide, so you might find that useful as well. And if you are going to Lodz and need a place to stay, I highly recommend the B&B Hotel Lodz Centrum. It is centrally located, just a block away from Piotrkowska, the building is modern and brand new, and the room rates are quite good. So make sure to check them out. These street arts are really cool. 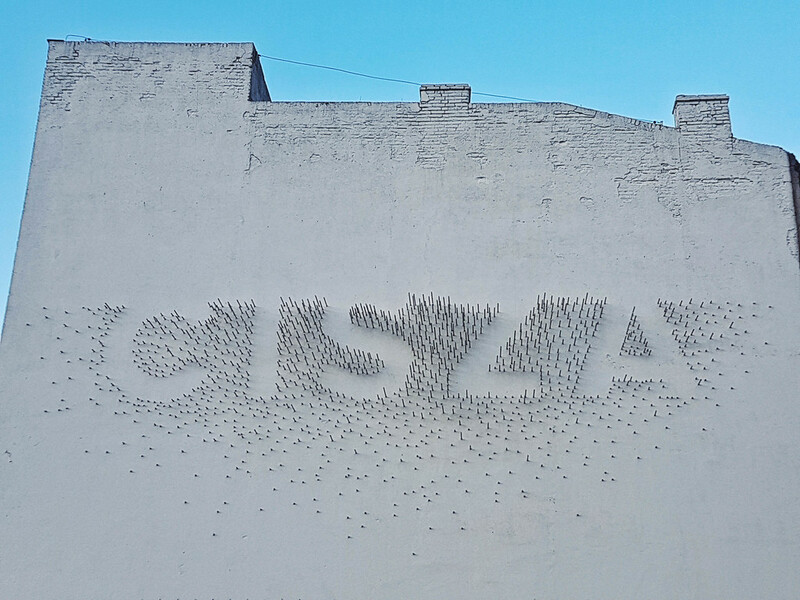 That art made from drilling in the wall is very awesome. Such amazing artwork!! I LOVE street art, looks like I have to add Lodz to my must-visit list!